Go paperless with hassle-free enrollment. MedSave allows you complete the enrollment online with the option of easily add / modify the beneficiaries to your policy at the time of enrolment. Inform us about your impending hospitalization, and we will ensure that you get the benefit of cashless hospitalization, green channel admission and also the option to avail of discounted tariffs at our network hospitals. This helps you reduce your out-of-pocket expenses even if your policy places a cap on the expenses covered. No more waiting! ePreauth facility at over 6500 hospitals with authorization in less than 2 hours. In case of hospitalization at a non-network hospital, send us an intimation before you are discharged and submit all documents online to have your claim reimbursed faster. You can claim reimbursement for all the medical expenses approved under your policy. Be it the cost of medicines, pre- / post-hospitalization expenses, expenses related to domiciliary hospitalization or outpatient benefits, we ensure speedy administration of all expenses covered under your policy. 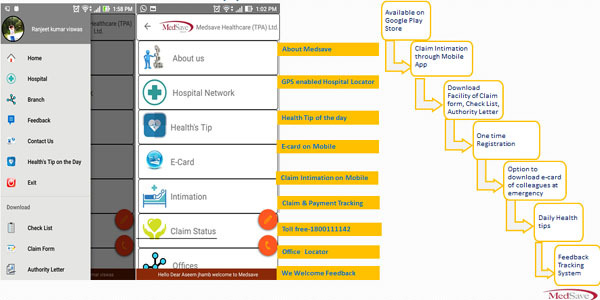 Join the MedSave Portal with your own personalised login and have real time access to real time tracking of your claims. You can additionally enjoy a host of other benefits if you create your login on our portal or app. Our MedSave Ranger meet you during the course of your admission at our network hospital to help you during your hospitalization. Our CareRanger also educates you about the necessary aspects of your health insurance claims as well as obtains feedback on our services and your experience during the hospitalization.